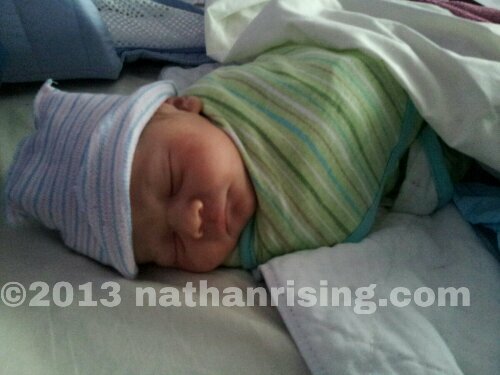 Just thinking about when John was first born…he was about 12 hours old in this picture. My, how quickly he’s growing! It’s do hard to believe he’s nearly 5 months old now! Nathan had his 15-month well-check yesterday! (I know, it was a month late, but the pediatrician’s office we go to stays booked.) 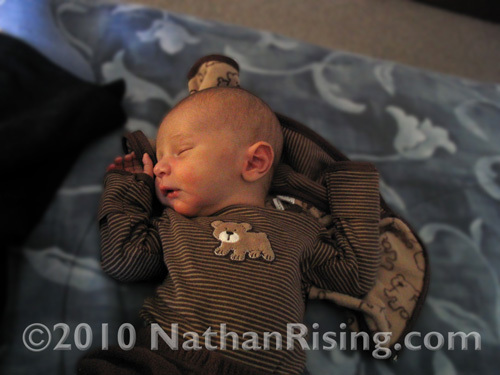 His weight and height are both in the 73rd percentile, which is wonderful because this time last year, we were having severe weight-gain issues with Nathan as my milk supply suddenly started to diminish. It took a change of pediatricians (to the one we currently have), a lot of pumping (using a hospital-grade pump) taking an herb called Fenugreek to help increase my supply, and supplementing with formula. And it took months of intensely hard work and perseverance to get Nathan out of that 1st percentile. (Yes, he became that skinny.) But now? Now, he’s a little Chub Monster with dimpled, meaty thighs, totally nomable cheeks, and a rotund belly that jiggles when he laughs. He’s doing great. He’s meeting all his milestones. Well, with the exception of feeding himself with a spoon. We’re having issues with that one because he still wants me to feed him. A few months ago, he was starting to spoon-feed himself and was doing well, but somewhere along the way, he decided that the food on spoons is meant to be flung. He became a food flinger. And then he would just play with his food and bang his spoon on his highchair. It drove me batty. When I saw the amount of food in his lap, on the floor, and even on the walls, I started worrying that he wasn’t getting enough and that he would lose weight and become a Thin Man again. I didn’t want that. So I just kept feeding him myself. And it looks like I’m not going to have to worry about him being too thin. So hey, Nathan. You’re going to have to start feeding yourself with your spoon, buddy. Even if it means half of your food ends up everywhere but your mouth and you have to go hungry for a meal or two before you figure it out. Trust me. When you’re around other kids, you don’t want to be the only kid in the room who can’t do something.